In 2015, artist and author, Julie Flett (she's Cree-Metis) created art that featured me, reading to children. That particular artwork was for Teaching Tolerance magazine. I experienced a range of emotions when she told me what she wanted to do. I was ecstatic, because, well.... Julie Flett's art and books are absolutely outstanding! That she chose to honor me--for the work that I do in children's literature--was overwhelming, in a good way. See my name, there? On the right edge, see Marcie Rendon's name, too? If you've not read Marcie's Murder on the Red River yet, or her short story, Worry and Wonder, get on it! Marcie's writing is terrific! That photo was taken by Katherine Rose Sabo, a teacher who saw the dress recently in the National Museum of the American Indian, in New York City (Sabo reads AICL). The work Jingle Dress is a quiet act of cultural empowerment, modeled after the contemporary Native American woman’s healing and dance regalia of the same name, which consists of numerous metal jingles adorning its surface. Made from regular blue lined note paper, the jingles on this artwork carry the names of over 500 Indigenous authors from North America. Each jingle represents one voice; collectively they make visible the written contributions of Native Americans. The stillness and contemplation of this work comments on the dichotomy that exists between the value of objects and knowledge. 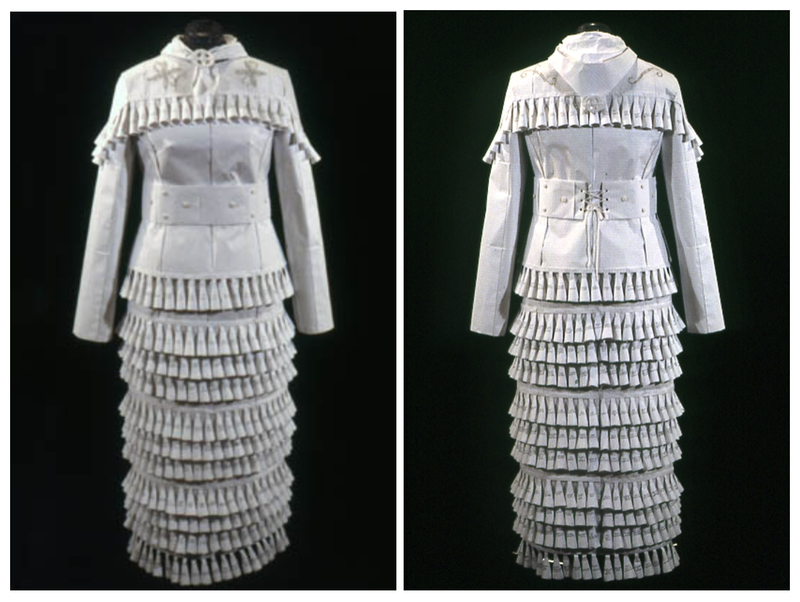 I gotta say--if I lived in New York City--or was within driving distance, I'd go there and study the dress. From what I see in the photos, it is exquisite! I don't know Maria Hupfield, but learning that I was included in this gorgeous work gave me a lift that I really needed. This, then, is a public thank you to her for including me in Jingle Dress! Editors note: Among the email I receive are ones from teachers who found a review on AICL helpful to their work with students. In this case, the teacher wrote to me about David Arnold's Mosquitoland. The email I received from "K" was interesting enough that I invited them to write it up for AICL's readers. Here's what K submitted. “White people!” I think to myself, about myself, channelling one of my student’s (head-shaking) refrains. I can see his friendly-mocking face and his shaking head as I read Dr. Debbie Reese’s post about her analysis of David Arnold’s Mosquitoland and her subsequent exchange with the author via Twitter. Sigh. As a white woman from an upper-middle class upbringing, I try to be very conscious of my white and socioeconomic privilege. I spend countless hours trying to choose books that provide both reflections and windows to my diverse students. Looking back on how much of my own studies were focused on white, European male authors, I know that that impacted me as a woman and regardless of how great these great works are, I know that they are not they only examples of greatness and many include dubious content. And yet, despite my own attempted awareness, I fell into my own trap of privilege, into a reading that I had the luxury of experiencing because I am “white people.” Having read and admittedly enjoyed Mosquitoland a few years ago, I recently found myself needing a book to start a conversation with my students about mental health struggles. I had been somewhat bothered by the protagonist’s casual dismissal of pharmacological treatments but thought that that, in and of itself (which problematic), could be a good conversation starter as non-examples often are. Many of my students have very entrenched views on certain medications and I thought that the book could give us a framework for those valuable discussions. While I found Mim’s flippant and self-serving treatment of her heritage less than ideal, I did see it as being characteristic of a teenager. I did not initially tie the “war paint” to that heritage but rather while reading too quickly thought about it as a female putting on makeup to face the (male) world (again demonstrating the privilege of my lens). Nor did it occur to me to factcheck the various references to cultural sayings and proverbs--I thought that was why authors had editors...and Google. When the starter curriculum I purchased turned me on to Dr. Reese’s article about the book and the controversy, I was appalled at my errors in judgement. I clearly owed all of my students, Native American or otherwise, an apology, but more than that, I owed them the truth. My Native students are primarily Paiute and Shoshone. The ones who made this last comment explained that what they meant was not white people claiming (à la Mim) to be Native American, but rather Native people who have more Caucasian features (i.e. blue eyes and/or blond hair). But none of them being Cherokee they’d had no clue about the misappropriated proverbs either. Thankfully, I was able to share Dr. Reese’s article “David Arnold’s Cherokee protagonist in MOSQUITOLAND” (March 07, 2015) with them, then we progressed to the Twitter exchange, compared Dr. Reese’s resume with that of David Arnold, discussed credibility and citing your sources, spent a period troubleshooting Arnold’s repeated fall-back to Mim’s “Cherokee” heritage and what alternatives he could have used (like, why not make her heritage Celtic?). We read an article about Elizabeth Warren’s similar claim to Cherokee heritage and the controversy it caused during her bid for Senate. We read about “Americans,” the current exhibit at the Smithsonian’s National Museum of the American Indian in Washington, D.C. dealing with the troubled history of the prominent use of Native American imagery in the U.S. since its inception. My students questioned and engaged with the problems of the story and the real life application but they did reflect that if they had been Cherokee, they would have felt hurt and offended by the misrepresentations in the novel. Where, we wondered, does an author’s responsibility to be accurate lie? Largely, my Native American students shrugged off the white author’s use of a character’s “Nativeness” as a plot tool. I worry that this is what they are used to seeing in literature. Thanks to Dr. Reese, what could have been an ignorant passing on of ignorance was instead a lesson for the whole class, myself included. We all got more out of the unit for the non-example Mosquitoland provided. All of my students learned about not only the complicated struggles surrounding mental illness, but also about how the Cherokee tribes determine enrollment and why; the history of using Native American imagery to represent “America” while the government disenfranchises those same indigenous populations; the problem of using another culture in one’s writing, especially when the history between those cultures is so fraught; and to question authority, whether it be an author, a teacher, or anyone who says something wrong or problematic, especially if you know better. 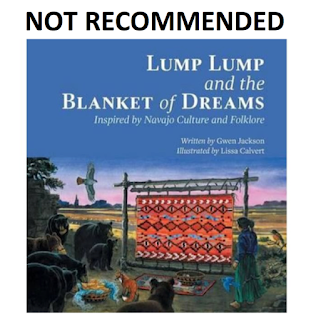 Over the last year or so, I've had several emails asking me about Lump Lump and the Blanket of Dreams. Written by Gwen Jackson, the subtitle is "Inspired by Navajo Culture and Folklore." It was published in 2016 by Friesen Press. When I see "inspired" or "based on" in a book title or in related information about the book, my critical lens kicks in pretty hard. Non-Native people are inspired to create a whole lot of not-good things! Mascots, for example. Those who created them were often "inspired" by some imagined aspect of how Indigenous people fight. In this case, we have a writer who is inspired--by a weaver and by what the writer perceives to be Native story--to create a picture book. Today we will live in beauty! Those of you who are Diné (or Navajo), or who know something about people of the Navajo Nation, will recognize the "in beauty" phrase as something that is significant to Navajo people. It is part of the Blessingway Ceremony. Lot of not-Navajo people are taken with "in beauty." It resonates, of course, and so people.... use it. Like Jackson did. She uses the phrase elsewhere in the book, too. In the story, Lump Lump is a little bear who doesn't like the idea of going to sleep for the winter. Blue Bird is a blue bird who is a storyteller who, on hearing Lump Lump's resistance to the idea of hibernation, tells him a story about a blanket of dreams. It is made up of items like "the white light of morning" and "the red light of evening." Lump Lump wants a blanket like that, and so, Blue Bird sets out to make it happen. With the help of others, all the items necessary to make this "blanket of dreams" are assembled and taken to Spider Woman, who makes the blanket for Lump Lump. Do the Navajo people have a story like that? Or did Jackson make it up? My guess is the latter, but we don't know. For hundreds of years, non-Native writers have been "inspired" by some story they think is Native, and go on to make their own. When that story is of that author's creation, I think it is inappropriate for the writer to use "inspired by" in the title, subtitle, or anyway in the book, because... it isn't of that nation any longer! Jackson thanks several Indigenous people in the back of the book. 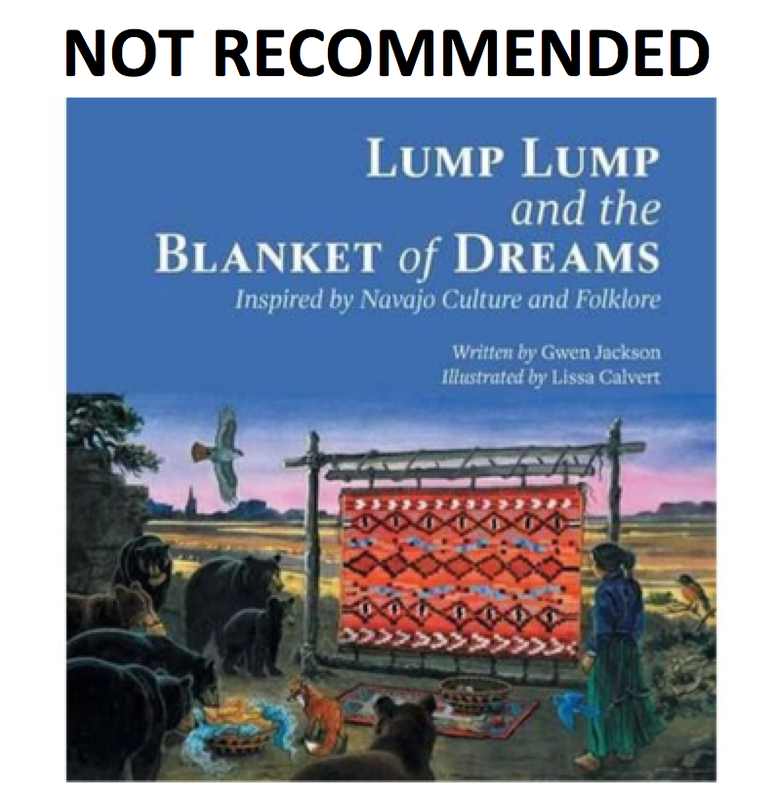 I ask writers to consult with Native people before doing this sort of book, but I grow increasingly wary of how they go about it--especially when the outcome is like Jackson's Lump Lump and the Blanket of Dreams. As you might imagine, Jackson's book is not recommended.